Ocean`s eleven is a 2001 newly remade of the caper film Rat Pack, 1960. Steven Soderbergh has acted as the director of the movie and has made a great work selecting the cast. 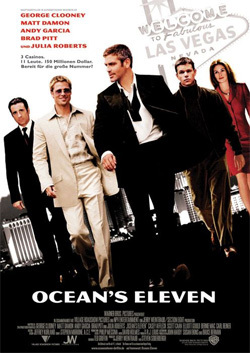 He noticed, that "the original 'Ocean's Eleven' is probably more notorious than it is good. It was the first time that the Rat Pack appeared en masse in a film. They were the epitome of cool and none of us felt like we wanted to compare ourselves to them or to what they were up to. You can't beat that. We took a completely different tack." Amazing actors feature a clever film about a casino heist where everything turns out the way the audience wants it to, with enough suspense to keep us from getting bored. Moreover, the talented director has supplied his fans with two more sequels Ocean's Twelve, 2004 and Ocean's Thirteen, 2007. However, there will be no more continue of the story. The leader of the heist is Danny Ocean (Clooney), who has gathered a team of charismatic and talented crooks. They need a highly sophisticated plan to go up elevator shafts monitored with laser beams, find out large numbers of key codes that change every 12 hours, break open one of the most secure vaults ever, and walk out with the money. Everything has to be done before the face of Terry Benedict, who is depicted as a ruthless boss of three Vegas casinos. By the way, we were hesitating about the rubric of this very article, as Vegas films can also embrace this topic. The plan goes off so smoothly that it's hard to believe there can be any suspense at all. Well, it is hard to start this paragraph with the appropriate words, as the movie involves all the well-known professional actors that don`t need to be promoted and praised. We can bet that thousands of women were jealous of Julia Roberts`s surroundings in Ocean's Eleven. She appeared to be the only one woman in the crowd of handsome, adventurous, smart men who love to play slot machine, blackjack and poker games in the movie. George Clooney, Matt Damon, Brad Pitt, Andy Garcia and others. Her working conditions were really tough, probably!